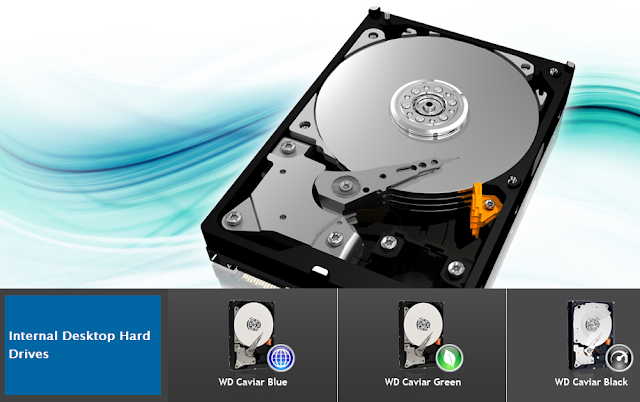 Western Digital, the leading storage company for over 40 years had offers a quite wide range of hard drive products. From its basic storage for mobile and desktop, WD also offers its robust products for both enterprise and AV storage in SATA/PATA interface. All of the Western Digital products are innovative and have the standards of quality that you can rely on. Hard Drive Speed is can be determine on its Rotational Speed per Minute or RPM, the higher the RPM rate the faster it read and write data. At present WD Caviar drives has a an RPM of 7200 with SATA 6b/s transfers rate. The fastest is the WD Velocity Raptor, it’s a SAS with 10k RPM. Hard drives that have a bigger Cache value and high-capacitive interface like the SATA 6GB and SAS are notably fast. Eco-Friendliness is one of WD's advocacies. A power saving technology,IntelliPark, it unloads idle drive heads to reduce aerodynamic drag, in turn reducing the amount of energy required to spin the platters. WD caviars have also features called StableTrac motor, which secures the motor shaft at both ends to reduce vibration to make your HD less noise. There’s no need to worry about the support because WD is consistent in giving warranties to all their products. WD caviar is at 3 years warranty and 5-years to enterprise storage. For Desktop computer storage, you can choose from Caviar Blue, Caviar Green and Caviar Black. WDCaviar Blue is the best selling hard drive with performance and reliability. Available in SATA 6, SATA 3 and PATA 100mbps interface. Its biggest capacity is 1TB with 8MB, 16MB or 32 MB cache. Best for everyday massive computing. WDCaviar Green a power saving drive with its first 3TB capacity.A cool, quite and eco-friendly model with IntelliPower, a mechanism that initiate fine-tuned balance of spin speed, transfer rate and caching, with 16MB, 32MB, or 64MB of cache and available in SATA 3. It could be the best option for Photographers and multimedia artist who need big space and it’s a power-saving drive. WDCaviar Black- is for maximum performance power computing and the words fastest 7200 RPM hard drive. Has a bigger storage capacity and cache options compared to WD Caviar Blue. Works in SATA 6 and also with SATA 3.An option for PC games and graphics related task. WD Scorpio Black-is Desktop like performance hard drive for mobile PCs. Has a 7200 RPM, 8 MB cache and the same capacity range with WD Scorpio Blue. I think this best for gaming or graphics notebook. Western Digital also offers their most robust and powerful storage for enterprise such as in Data centers, online servers, and so on. WD RE4- Equipped with dual actuator technology (on 2TB) and has a twice processing power. Spin at 7200 RPM with 64 MB cache and SATA 3Gb/s transfer rate. WD RE3-Almost the same with WD RE 4 but 1TB is the highest capacity and has a 16MB or 32M cache. WD RE-4GP- First 2TB Enterprise drive and it’s the lowest power consumption in the industry, IntelliPower equipped with 64M cache and SATA 3.Available in 1.5 TB and 2TB capacity. WD Velocity Raptor-The world fastest SATA hard drive with 10,000 RPM in 16MB or 32 MB of cache. Works in SATA 3 or SATA 6 interface and 600 GB is the highest capacity. AV drives is eventually used in Surveillance Cameras and Multimedia applications in a fanless environment in where the drive operates below 65° C base casting temperature. WD AV-GP -24 x 7 reliability with less temperature pressure and power consumption.2TB is the biggest capacity. WD-GP is designed for audio and video environment with 24x7 reliability and capacity supporting PATA.7200 RMP and 8MB cache. WD-25- the first 2.5-inch AV hard drive, with 5400 RPM, 32 MB cache and 500 GB is the highest capacity. Remember that a less temperature pressure hard drive has the longest life span compared to over-heat prone type.